What started as an audacious idea, to open a storefront to promote non-corporate media, is about to pass a 20-year mark as an ever-growing counter-culture oasis in downtown Gainesville. If you are reading this, you might be one of its supporters, perhaps aware of the CMC for the whole run, or perhaps you weren’t born yet when the run started. It’s been that long. The CMC has touched countless lives— attendees at events the CMC created, volunteers who gained experience, musicians who were provided a place to play when starting out, people who checked out a book or DVD they might not have run into otherwise, even people who through the CMC met another person who changed their life, or even became a life partner. And definitely life-long friends have been created, and advances in peoples’ knowledge and understanding of the world we live in as well. Green Drinks is a networking opportunity for anyone interested in learning about environmental issues and sharing news about sustainable businesses and initiatives. Cinema Verde is an annual environmental film festival held in February (Feb. 13–16, 2014). Now the two have come together to provide the monthly networking followed by an environmental film and discussion. The Civic Media Center will host a night of local and regional artists reading and performing original works of poetry, spoken word, and short prose on Saturday, Oct. 19, beginning at 8 p.m. The event is organized in honor of the 20th anniversary of the founding of the Center and its long-running weekly open reading, The Thursday Night Poetry Jam. The Poetry Jam is the longest-running open poetry reading in Gainesville, and one of the longest-lived independent, grassroots poetry-oriented event series in the U.S. Plum Creek Land Development Corporation has been in the process of testing the feasibility of developing a massive portion of Eastern Alachua County. By inviting key persons into this process, they have begun to develop a master plan, similar to the already-existing Alachua County Comprehensive Plan. Politicians, Plum Creek administrators and personnel, businesspeople, investors, educators, state and local government agency representatives, plus a plethora of interested organizations have been gathered over the last couple of years into what the corporation’s public relations specialists are calling the “Envision Alachua” process. From the publicity that has come out of these charettes, very few definitive details have surfaced. An uninformed reader would probably conclude that the objectives of Plum Creek Corporation and the rosy plans they are espousing are harmless and probably healthy for the future of the county. Well, don’t worry! 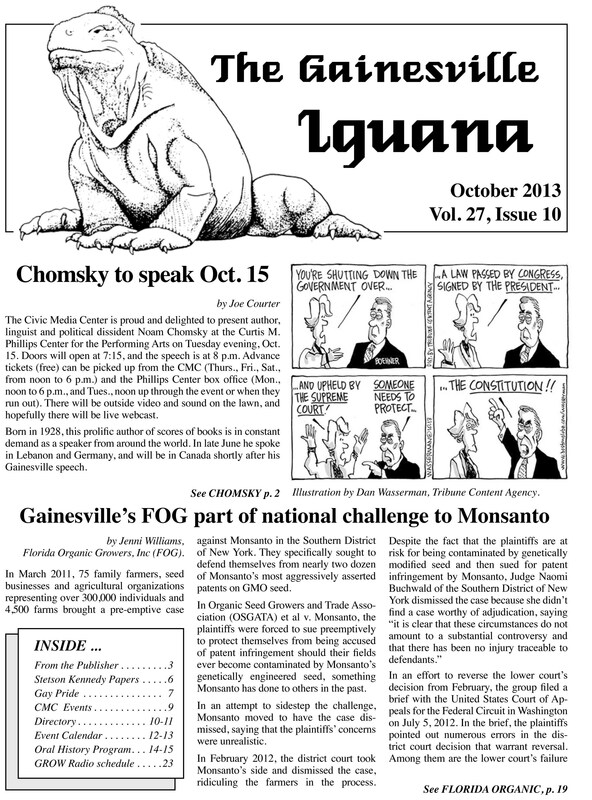 We have the whole October 2013 issue here for your perusal. The Publix Truth Tour launched on Sunday, Sept. 22, with a dramatic send-off from some of the CIW’s most stalwart allies in Gainesville. The partnership between Immokalee and Gainesville is so strong, in fact, that the day’s activities marked not only the beginning of the Truth Tour, but also the culmination of the city’s annual “CIW week,” a full seven days of local education, activities and action to call for fairness in the fields. The sudden and tragic passing of owner Charlie Scales in turn has led to the closing of Hyde and Zeke Records, after over 36 years as an integral part of the Gainesville music scene. The thousands of friends who shopped at Zeke’s made the store a gathering place for music lovers of two generations. The loss of Charlie Scales and the shuttering of Hyde and Zeke Records are a huge double blow to many. As a cofounder of Hyde and Zeke’s, I’m still reeling. Two memorials for Chas have helped me recognize and appreciate his gifts to the community. But there has been no such ceremony for the store, so I hope you will allow me a few words of remembrance and gratitude. This is the seventeenth in a continuing series of transcript excerpts from the collection of the Samuel Proctor Oral History Program at the University of Florida. Liz Fusco Aaronsohn was interviewed by Paul Ortiz [O] in 2012. A: I’m Liz Aaronsohn. I was Liz Fusco in 1964 and that’s how people down here know me. O: Liz, I wonder if you could talk about what led you into the Movement. A: I’ve written about that, there’s a book called Owning and Disowning White, edited by Jim O’Donnell at the University of Arizona. The whole idea of whiteness and how white people came about, their commitment and all that stuff is really a topic of conversation. We’ve talked about it at National Association of Multicultural Educators for the past several years, and several books are out like ours. Basically, I will say this: my father was a rabbi and he taught me justice, justice shalt thou do, and I took him seriously. Period. That’s it. On Saturday, Oct. 26, Gainesville residents and others will gather for the 2013 Gainesville Pride Parade at noon at 7th Street and West University Ave. The parade will travel to Bo Diddley Plaza downtown, ending at the annual Pride Festival. The festival will feature local music acts, vendors and a kids’ space. The event is free and open to the public, and is co-sponsored by the Pride Community Center of North Central Florida and the City of Gainesville Department of Cultural Affairs. In 2013, with so much information readily available about HIV, the stigma felt by people living with HIV is still widespread. Further compounding this stigma is the isolation experienced by many, as a result of distance and lack of transportation to support services for those in rural areas. This is the reality faced by many women living with HIV in North Florida — a reality that the Peer Advocacy Program, Let’s Talk About It (LTAI), is working to overcome by diversifying opportunities for women’s involvement, support and advocacy. Since 2011, the LTAI program has reached out to HIV positive women and female caregivers in North Florida. The LTAI Peer Advocates develop testimonial media to challenge HIV stigma, improve health services for the community and to promote HIV prevention. The papers and writings of Stetson Kennedy, firebrand activist, writer, and folklorist of the American South, have been donated to the University of Florida by the Stetson Kennedy Trust. In this major acquisition, Kennedy’s papers will join those of Marjorie Kinnan Rawlings and Zora Neale Hurston as part of the literary manuscripts of Special Collections, George A. Smathers Libraries. The University of Florida will commemorate the opening of the Stetson Kennedy Papers on Oct. 22 with a celebratory symposium, “Stetson Kennedy: Re-Imagining Justice in the 21st Century.” Featured speakers include acclaimed author and FIU professor Marvin Dunn, former director of the American Folklife Center at the Library of Congress Peggy Bulger, and Lucy Anne Hurston, author and niece of literary luminary Zora Neale Hurston. With all of the hullabaloo over the traffic-calming bike lane test on NW 8th Ave., you would think the great front in the battle to improve our city is taking place on the street. Indeed, bike lanes on paved roads have been the enduring and traditional approach to improving multimodal transit in Gainesville since the early 1980s. But the global bike-ped advocacy movement has caused us to rethink approaches to politics and urban planning. It’s not just about building more lanes, but about getting people out of their cars, changing perceptions about safety, and urging our community leaders and government to make progressive decisions about multi-modal transit. Jeff Mapes’ Pedaling Revolutions: How Cyclists are Changing American Cities catalogues these trends across our nation. They are beginning to emerge in our own community. It is hard for me to wrap my mind around the events in the world at this moment in October 2013. Here I am in Gainesville, Fla., a city I came to exactly 38 years ago, under the premise of taking a winter away from snow. Within a year or two, I’d found three circles of people whose successors (and the same people themselves) I am still around today. There was the anti-war crowd, the feminist crowd and the acoustic musician crowd. These circles have become my family, not just for love and solidarity, but within them they represent, at least for me, the best of human endeavors, and relief and refuge from what has become an increasingly crass and commercialized culture. October is full of anniversaries for me. October 1969, my freshman year of college, was the national student Moratorium Day when campuses all across the country went on strike and held teach-ins on the Vietnam War—an unforgettable baptism into the anti-war movement. 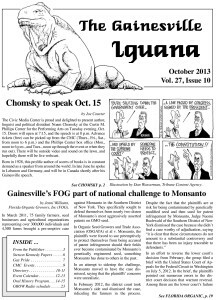 It was October 1986 that Jenny Brown and I started this little paper in your hands (or on your screen, Internet readers), the Gainesville Iguana. And in October 1993, as written about elsewhere in these pages, was when the Civic Media Center opened its doors for the first time, a project stimulated by the late Charles Willett, a project that has been my informal Masters and Doctorate experience, and a project to which I’ve been devoted to now for 20 years—a fantastic evolving community resource. The Civic Media Center is proud and delighted to present author, linguist and political dissident Noam Chomsky at the Curtis M. Phillips Center for the Performing Arts on Tuesday evening, Oct. 15. Doors will open at 7:15, and the speech is at 8 p.m. Advance tickets (free) can be picked up from the CMC (Thurs., Fri., Sat., from noon to 6 p.m.) and the Phillips Center box office (Mon., noon to 6 p.m., and Tues., noon up through the event or when they run out). There will be outside video and sound on the lawn, and hopefully there will be live webcast. Born in 1928, this prolific author of scores of books is in constant demand as a speaker from around the world. In late June he spoke in Lebanon and Germany, and will be in Canada shortly after his Gainesville speech. The CMC invited him to Gainesville to mark its 20th anniversary; he came in 2003 for its 10th, speaking to over 6,000 in the O’Connell Center, and he was in Gainesville in 1993 and helped dedicate the brand new CMC on its opening day. In March 2011, 75 family farmers, seed businesses and agricultural organizations representing over 300,000 individuals and 4,500 farms brought a pre-emptive case against Monsanto in the Southern District of New York. They specifically sought to defend themselves from nearly two dozen of Monsanto’s most aggressively asserted patents on GMO seed. In Organic Seed Growers and Trade Association (OSGATA) et al v. Monsanto, the plaintiffs were forced to sue pre-emptively to protect themselves from being accused of patent infringement should their fields ever become contaminated by Monsanto’s genetically engineered seed, something Monsanto has done to others in the past. In an attempt to sidestep the challenge, Monsanto moved to have the case dis- missed, saying that the plaintiffs’ concerns were unrealistic. For years “Pronoun trouble” meant nothing more to me than a good laugh at a classic bit of Vaudeville between Bugs Bunny and Daffy Duck. In the classic cartoon Bugs repeatedly convinces Daffy to get himself shot. In an effort to unwind his undoing, Daffy slows down their verbal tennis match, having his ah-ha moment when he catches Bugs switching pronouns. “Pronoun trouble,” says Daffy. The sophisticated bit always made me laugh… but that laugh is a tad tainted now.